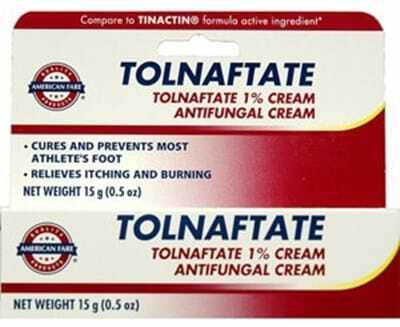 Tolnaftate cream is an antifungal agent. It is used to clear up conditions such as ringworm, athlete’s foot, and of course, toenail fungus. It is a topical solution that can be applied directly to the skin. That’s why many people use tolnaftate cream to remove toenail fungus. It works by prohibiting the growth of a fungus. By blocking additional growth and spreading, the fungus becomes less powerful, and can eventually be fully healed. If you’ve ever experienced toenail fungus, you know how quickly it can spread. Tolnaftate is a key ingredient in blocking fungal growth. Using tolnaftate cream is a relatively easy process. However, there are certain steps and precautions to keep in mind. Use this article as your guide to using tolnaftate. When used properly, it can help to clear up toenail fungus and prevent the spreading and growth of existing fungal infections. 1.3 Where Can You Get It? 2 Is Tolnaftate Cream Effective? Typically, you don’t need a prescription to use this cream. However, you should always consult with your doctor before starting any medicated treatment solutions. Your doctor may be able to give you more insight on how to use the cream effectively. Using this topical antifungal agent for toenail fungus is a simple step-by-step process. Thoroughly wash the affected area. Shake the cream well before use. Apply the medication to the affected area. Rub in the cream to cover the fungal infection. Unless directed by your doctor, don’t bandage or cover the infection. Give the medication time to soak into the infected area and fully dry. Immediately wash hands after applying the cream. If you skip hand-washing, you may risk spreading the infection. You should use tolnaftate cream around the same time every day. This allows it to work in a rotation. If you miss a dose, apply it as soon as possible. If you miss it completely, start back on track with your regular schedule the following day. This cream should be used as a yellow toenails treatment option until it is gone, or the fungus is completely healed. You should never stop treatment early. The cream works by blocking the growth of a fungal infection. Cutting it out too early can allow the infection to grow, even if it appears to be mostly healed. Additionally, if you don’t use the cream to heal the fungus fully, the infection may grow stronger in the future. It can lessen the effectiveness of the tolnaftate, making it harder to clear up the infection if you use it again. While a fungal infection may not fully become immune to treatment, it can grow stronger against treatments that have only been partially completed. If you are using a tolnaftate cream for a fungal infection, follow the dosage instructions carefully. You may need to continue to use it for several weeks after the fungal infection clears up. It cream should be used for topical purposes only. It should never be ingested. It’s also important to keep it away from your eyes. If the cream is ingested, call poison control or the emergency room immediately to seek out proper medical care. No type of the medication should ever be taken orally. Administering to a child under the age of two. This is not advised, but there is not yet enough research to determine if the cream has any effect. Side effects for this treatment are rare. More often than not, they come as a result of an allergic reaction. If you know you are allergic to certain medications, speak with your physician before you use tolnaftate cream. It can usually be found in any pharmacy. There are generic versions, as well as brand-name treatments. The most popular and common commercial tolnaftate cream is Tinactin. 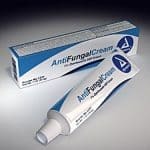 Any antifungal cream with tolnaftate as the main ingredient will help to heal toenail fungus. While it is unlikely that it will interact negatively with any other topical or oral medication, talk with your doctor about any other medications you may be using before applying it. Tolnaftate can be used with other antifungal solutions, with doctor approval. You can also take precautionary measures to prevent the growth of toenail fungus. This can help it in its overall effectiveness. It can also help your fungal infection to heal faster. Wear properly fitted shoes. Shoes that are too tight can trap moisture. This creates a perfect environment for a fungus to grow and thrive. Changing socks at least twice a day. This is especially effective if your feet tend to sweat excessively. Consider wearing antifungal socks. Keeping your toenails clean and neatly clipped with nail trimmers so that treatments can work better. Do something to improve the blood flow to your toes and feet. Consider getting a massage or using a good electric foot massager. Alternate the shoes that you wear each day. This can help in giving your shoes time to air out. You can also use ultraviolet devices to kill fungus in the shoes. Sprinkling an antifungal powder in your shoes each night. Any of these measures can help in increasing the effectiveness of tolnaftate cream. The more proactive you are in stopping fungal growth, the faster that it will go away. Once you know how to use tolnaftate cream for mild toenail fungus, it can be a good treatment option. Because of its rare limited side effects and ease of use, it’s safe to apply. If you need a way to remove an infection more quickly, take a look at the Purely Northwest toenail fungus system. What is the Best Over the Counter Toenail Fungal Cream?